I was talking to a new coaching client just the other day. When we came to the end of the conversation she said “I want to say that you’re really simple Liz – but that’s not what I mean!”. I suspect my family would have something to say about that. She went onto say “what I mean is that you bring clarity to the conversation” – I think that’s the bit I’ll share with my family. Given my work with VoicePrint, I take that as an enormous compliment. 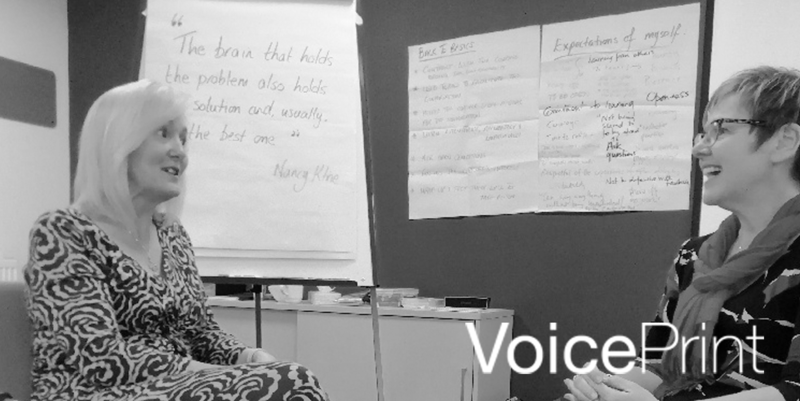 Clarity is what VoicePrint is aiming to bring to all conversations – clarity of both intention and of how we articulate that so that conversations can be as productive as possible. A coaching client, let’s call him Chris, shared an anecdote with me recently about a choice he made in a meeting with his Board Colleagues. 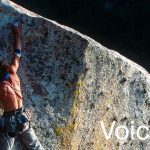 He reflected that his decision to use a different voice than he would usually have used had a dramatic impact on the direction and outcome of the conversation. The discussion was focused on an issue with a pragmatic, short-term solution and a less tangible long-term option. The weight of opinion was in favour of the short-term but Chris felt that the longer-term option deserved more of a hearing. He has a strong Advocate voice in his repertoire which naturally leads him to state his opinion and thoughts on a subject. He recognised that this would have been his natural choice in this situation. Instead he chose the more neutral voices of Articulate and Critique. He used his articulate voice to summarise the conversation so far and then Critique to weigh up the pros and cons of each option. He was surprised by the impact this had. His colleagues picked up the conversation and spent more time questioning and exploring the two different options. After a healthy and robust debate, they changed their minds and settled on the longer-term option. Chris was struck by the impact his choice of voice had on both the course and quality of the conversation. 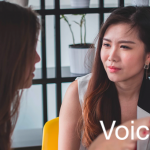 When working with VoicePrint, we encourage people to consider both their own preferences for how they hold conversations and also to think about what a particular conversation needs at that moment in time. Chris’ example is a great illustration of how, with an awareness of the different voices, we can shift the focus and quality of a conversation. With so much of our time spent in conversation with others, whether one-to-one or in meetings, having the flexibility to vary our contribution and impact is a powerful tool. 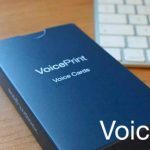 And the beauty of VoicePrint is that it is easy to understand and can be put into practice straight away.